Personalities will clash and opinions will vary. We can’t force people to “like” or agree with each other but we can expect them to line up with God’s design for His people to function a certain way. It becomes about obeying Him, not doing what “we” think is right. We’re commanded to act and react toward one another in ways that build up and unify, not tear down and divide. The “one another” commands of Scripture provide specific ways we’re to treat people, laying the basis for expecting church staff to adhere to Body Life principles with those they serve and among team members. God lists expectations of how love does and does not act or react in 1 Corinthians 13. If love sits at the top of God’s “to do” list, then these traits need to be a priority in how we function, or don’t function, as a staff with one another and those we serve. 2) Offer hospitality to one another without grumbling. Although the Greek word for hospitality literally means a love (philos – friendship sort of love) of strangers (xenos), here we’re told to extend hospitality to one another … those we know, fellow members of the Body. Think of the significance of this command. Sometimes we treat outsiders better than we do one another. Sometimes we treat the people we serve better than fellow staff. Or, sometimes we “do” what we should do for and with one another but we grumble about it. God addresses our attitudes in serving, so shouldn’t we? 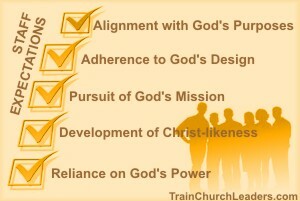 3) Serve others, faithfully administering God’s grace to them as you use your spiritual gifts. Ministry must get beyond personal fulfillment and accomplishing “my” agenda. When we use our spiritual gifts, we administer God’s grace in its various forms. The question isn’t what I can get out of it but what I can give. As faithful stewards we answer first and foremost to God for that which He’s entrusted to us. Staff expectations therefore revolve around accountability to God and His desires for serving one another as commanded in His Word. Start in the recruitment process to explain how staff are expected to relate with one another and those they serve. Go beyond skill development in training to how what they do fits into the bigger picture of God’s design for the Church and the implications of that. Establish a biblical policy for how staff should handle grievances or disagreements in ways that follow Body Life principles so as to leave no room for excuses in letting problems get out of hand. Address relational issues in staff evaluations with both grace and truth, treating them as you expect them to treat others. This entry was posted in Staffing.